When one masters the art of cooking beans from scratch (go me! ), one must find delicious things to do with said beans. And the thing my mind instantly goes to is tacos. Did you ever have crispy tacos growing up? That was one of my favorite meals. 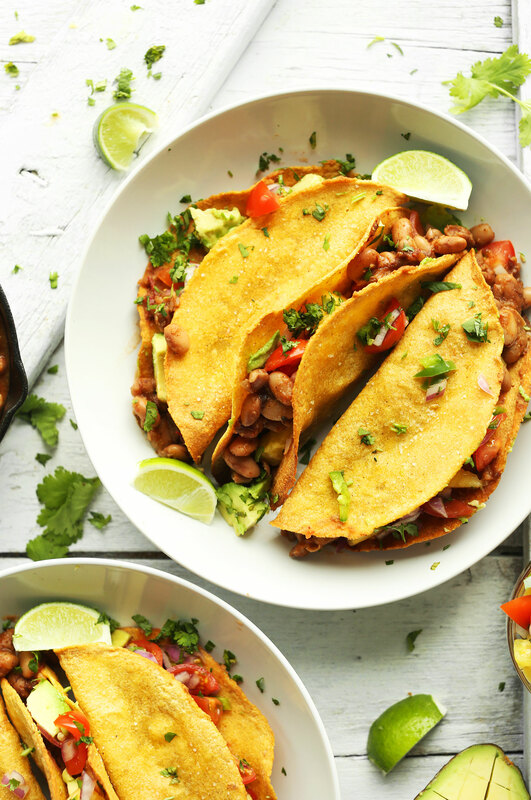 Crispy taco shells with tons of fillings that always, always involved corn and cheese. As you can tell, little Dana liked her carbs and dairy. But instead of frying the shells, I figured out a simple way to bake them and get them crispy! Simply fold the edges over a baking sheet and bake on top of a second baking sheet. Or, rest mini cupcake liners inside a folded over soft tortilla and bake until crispy and golden (see image below)! Yes, it’s that easy. And the whole recipe comes together in just 30 minutes. For fillings, I immediately knew I wanted to go for my Mexican Pinto Beans from Scratch (made in 1 pot). 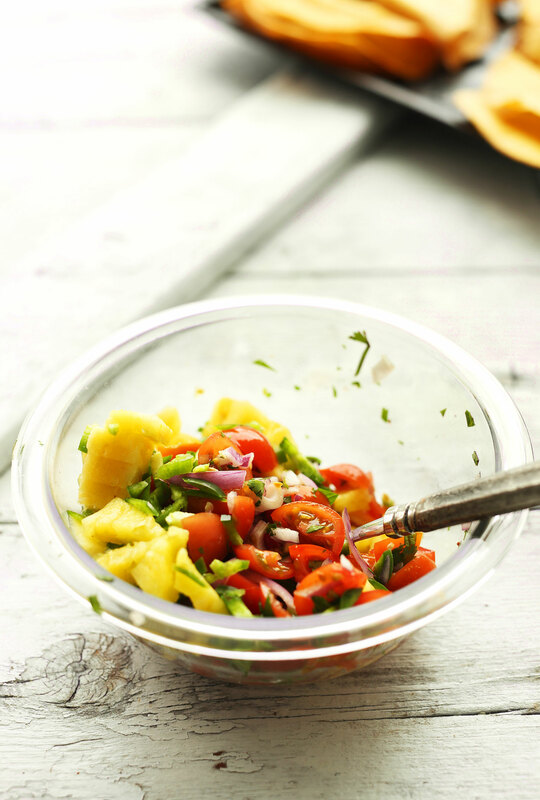 And because I’ve been seeing pineapples popping up everywhere these days, I paired it with a simple pineapple salsa. However, you could always keep it simple and use your favorite store-bought salsa, or try my go-to Blended Red Salsa recipe. If you give this recipe a try, let us know! Leave a comment, rate it, and don’t forget to tag a picture #minimalistbaker on Instagram! We’d love to see what you come up with. Cheers! 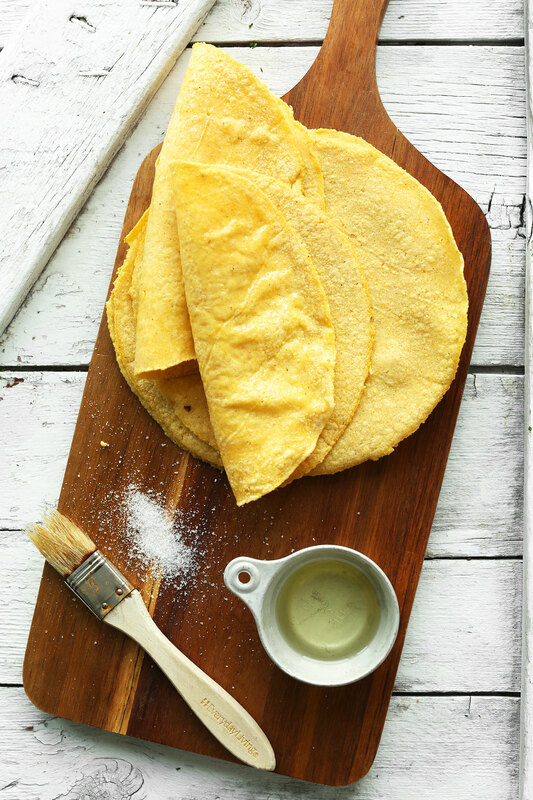 Lightly brush tortillas on both sides with oil and sprinkle with salt. Then stack two baking sheets and lift one side. Tuck as many tortillas as will fit comfortably on the edge. Then lower the top baking sheet and fold the tortilla over the top so it forms a shell shape. In addition or alternatively, simply arrange tortillas on a baking sheet, fold over, and slide two mini cupcake liners inside the shell so it creates an opening. See photo for guidance! 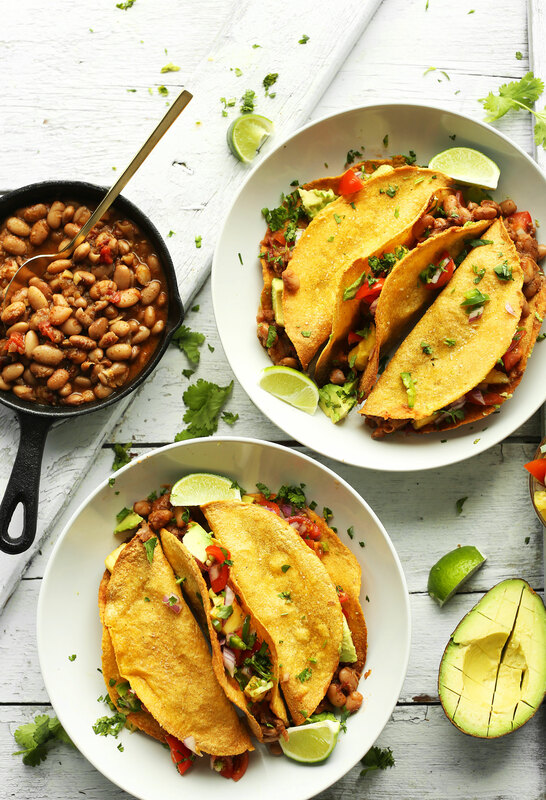 Once tacos are done baking and slightly cooled, fill generously with pinto beans, pineapple, and other toppings. I went with avocado, hot sauce, and cilantro. The shells are best when fresh. I would only make as many as you want to enjoy immediately as they tend to lose their crispiness when stored. *I also think this Blended Red Salsa would be delicious with these tacos! *Nutrition information is a rough estimate calculated without additional toppings (i.e. avocado). I’ve tried some of your recipes and they are all super delicious. I love the 10 ingredients and the short amount of time most of your recipes require. This specific recipe is a keeper. Love how all the flavors combine. Thank you!! Yay! Glad you enjoy this recipe, Jessica! I’ve made these so many times! Although, I sub out the pineapple in favor of mango, and wowza, is it good! I use the taco method in so many other recipes now! Another go-to for my fam! Oh wow. I wasn’t expecting these to be so good! I used pre-made taco shells which took most of the time and effort out of the dish. I used chipotle paste in the beans too and had it with avocado. I also rinsed a tin of baked beans and added those to make it go a bit further. The salsa was so delicious. Quickest and tastiest dish I’ve had in a while. Yum! Just made this using filling of TVP and potato & looking forward to the bean filling! Hubs just finished happy 4th taco :). Wow SO very good… Finally have an outstanding taco shell. I always get excited when I google a recipe & Minimalist Baker pops up…my go-to source for sure! Thank you! Have never tried the sheet pan shell method but always just hang the shells over the oven grates leaving one rung in between so they stay nice and open to stuff. Works like a charm! You an also just hang the taco shells over the oven racks so they hang down between every other bar. This also gives you a nice flat bottom so the shells can practically stand on their own! I also had the same problem with my tortillas not staying folded and when I forced them to fold, they just tore down the middle. So we also ended up with taco bowls :) Will definitely need to get larger tortillas next time. I found our dish needing more flavor. But overall, it was a very simple dish to prepare which I love and I also loved the salsa. We had a little extra and used it in an omelette the next morning; superb! Making these for the second time tonight. They are SOOOOO good. I kind of failed at baking the taco shells the first time, so this time I think I will leave them flat and make as more of a salad, putting the beans and toppings on top. Major yum! Lovely! Thanks for sharing, Kara! 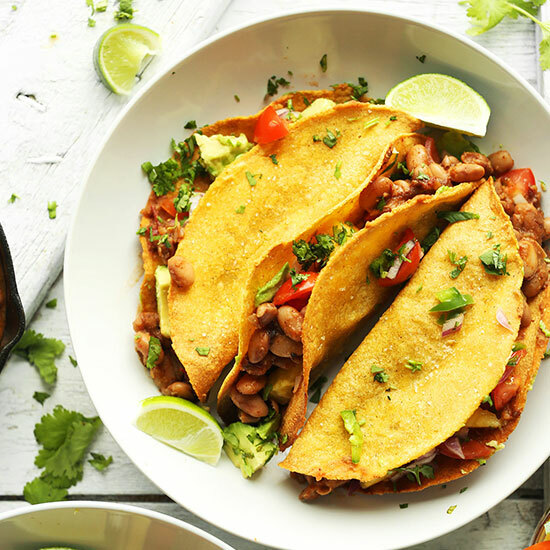 We made a variation of these (used your beans and baked tortillas using the muffin liner method but used a different salsa) these for tonight’s taco Tuesday and they were boss! The tortilla idea is genius. Taco shells without frying…? Whaat?! 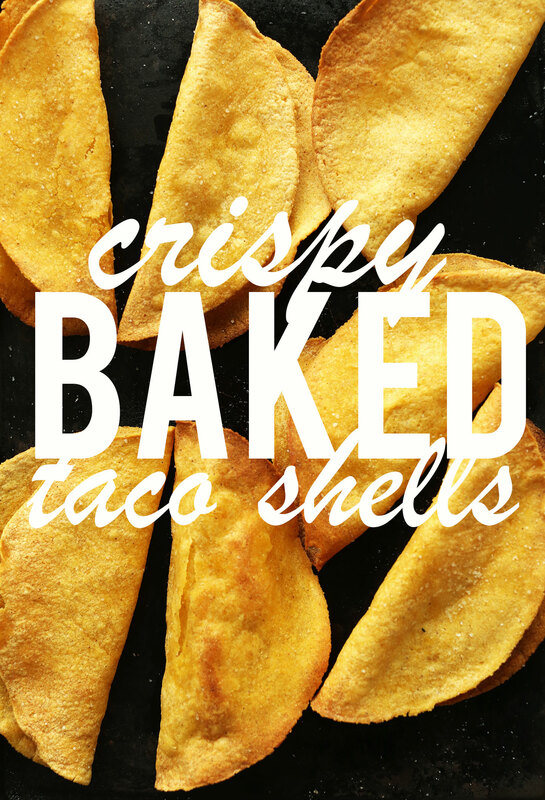 Kudos for this healthier crispy taco shell method. This is definitely a must try. I love this recipe, it’s full of flavour and is perfect for the season! I used foil bunched into balls to keep the corn tortillas open and it worked perfectly (mine weren’t fresh, they had been in the freezer!) if you’re having problems creating the shell please try this method! Dana, your recipes are so creative and yummy! Please carry on! Hi Dana, I LOVE your food photos! They are so sharp and clear. I am pretty new at photography, still have a lot to learn. Will keep an eye on your recipes and definitely try them out! Recipe sounded good but when it came to execution there are flaws in this recipe. The recipe does not tell you whether or not you should drain the beans. We weren’t sure the beans would get cooked thoroughly if we drained the beans so we did not. Even after doubling the spices; the beans lacked flavor. All of our corn tortillas split when we tried to fold them over and was a disaster. I would love to see a video how you folded the tortillas without them cracking unless you made fresh tortillas? The salsa was delicious and best part of the recipe. Hmm, draining the beans slightly will help with flavor. And I always season “to taste” because some people don’t like them as salty/spicy I do. As for the tacos, I think it’s key that the tortillas are as fresh as possible! I actually snagged mine from a local taco shop. Good luck next time! Thanks for the feedback. Made them last night! So delicious! I tried making the taco shells last night and o couldn’t get the tortillas t fold over? Maybe with flour tortillas? The corn tortillas just sprung back up or tore down the middle if I tried to bend them over. Anyone else have this problem/ suggestions? Yes! I had the same problem :( I ended up wasting 4 tortillas and started over. I added a little more oil to the new ones, but it just wasn’t working. We ended up just breaking them apart and ate this nacho-style. Either way, it was delicious! Sounds like the tortillas weren’t fresh! Get them as large and as fresh as possible, that way they won’t flop back over. I even grabbed mine from a local taco shop! Yay! Thanks Sarah! So glad you enjoyed them. So cool you used to live here! Where do you live now? Hey Dana! These tacos look delicious I can’t wait to try them! ;-) … I wasn’t sure where to ask this question but I am looking to get a new lens for my camera because I’ve just been using a very beginner one that my camera came with and I’m not happy with the clarity … So my question is, in your “shop” section, are those the two lenses you currently still use??? And are you able to use them without a tripod? I don’t like using a tripod but wasn’t sure if this lens is really picky? Thanks so much!!! ;-) hope you are having a great day! Yes! I use a 50 mm, and an extension tube when I want close ups – still love them! And yes, they’re great on a tripod, but I don’t use one. Oh wow! Taco shells without frying…? Are you kidding me girl?? You have the best healthy tips! That’s just a must try. Kudos for the bean cooking ;) I love eating them, afraid to cook them. My boyfriend is not a fan of pineapple, do you think the sauce would turn out okay without the pineapple chunks? Thanks! yes, the pineapple was optional – hope you love it! Had already planned on making the ‘Mexican pinto beans’, but when this recipe popped up in my feed I knew I had to step my game up. Went with store bought salsa since it was last-minute decision and served it with guacamole, quinoa and sriracha. Absolutely delicious and super simple – thanks! Also got your book, loving the beautiful pictures and really looking forward to trying out the recipes. Oh my!! That salsa is a wonderous creation! So much flavour in these! 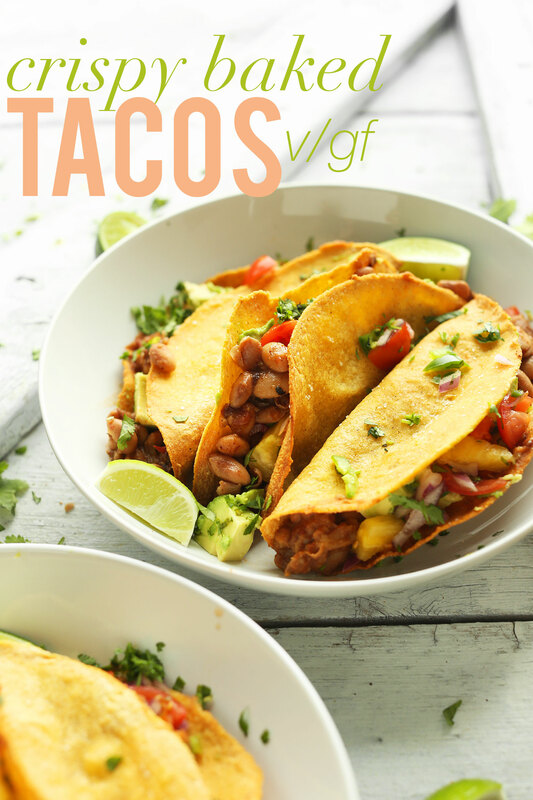 I am 110% a crispy taco shell girl myself – loving this sneaky (and healthier!) way to make the shells at home. Also SO excited to try your bean recipe! When I think of beans, I think of burritos and burrito bowls first thing! Both are delicious, of course. In fact, I’m more of a taco person! This would be great with some BBQ jackfruit and TONS of guacamole! 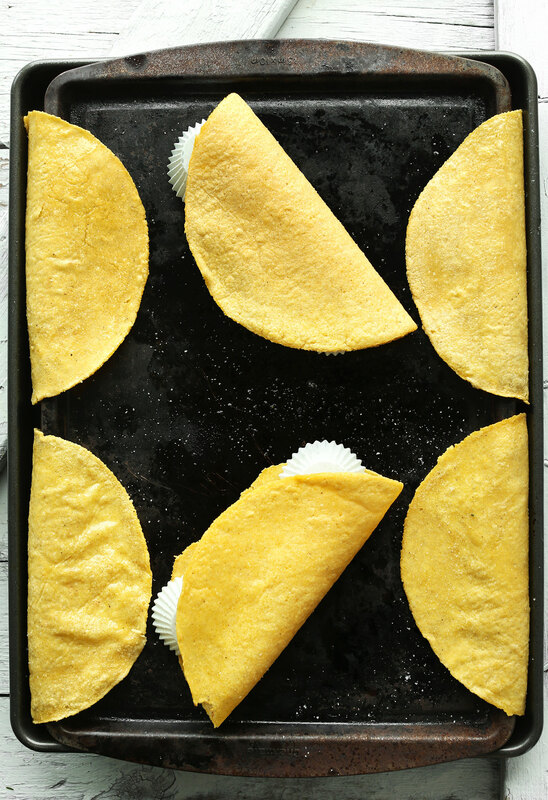 High fives all around for your crispy taco shell method without frying! Brilliant. Wow. Looks yummy. Worth a try. Very nice snaps. Thanks. It looks so nice I almost forgot I hate pineapple!